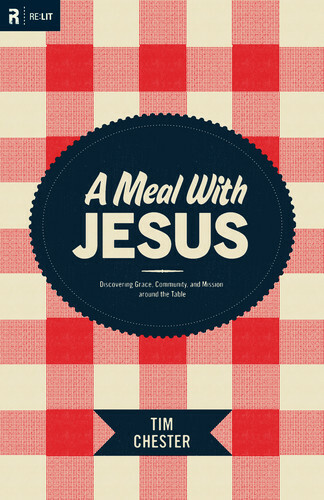 This book's subtitle caught my attention: Discovering Grace, Community and Mission Around the Table. A Meal with Jesus seemed like it would hit upon one of my "hot button" issues - hospitality. (I think we, as Christians, have fallen out of habit of offering genuine hospitality to others, hence one of the big reasons I started the other blog - Offering Hospitality - and continue it with the help and partnership of Stephanie.) As a general rule, women and families today come up with a lot of reasons why they are incapable of practicing the art of hospitality with others. It could be that life is "too busy." Or perhaps the house is thought too small or the budget too sparse. We are afraid of one another. We feel like we can't provide a decent meal or that there is no way we could clean our house and decorate it in Martha Stewart fashion. We forget that hospitality isn't about impressing. It's about blessing. It is about building community. Because this is a pet topic of mine, I rather wanted to find out what Tim Chester had to say on the topic. Now, I do have to be honest and admit that I did not care for Chester's "voice"/writing style in this book. He is extremely passionate about fellowship and communing with others and I think he is passionate for and about all of the right reasons. He builds up his argument for why it is important to fellowship with others over food in particular in a Biblical fashion, laying out his verses and arguments decently enough. I don't feel the need to spell out his reasons here. Read the book if you want to know why he would argue, Biblically, that it is important to fellowship around meals. I would say that I concluded reading the book thinking about how Chester must like Radical, by David Platt (linked to my thoughts.) Chester is passionate about finding fellowship among the poor and needy. He doesn't pay attention to social classes, religion or what movies another person might watch when deciding who or who not to fellowship with. He strongly urges Christians to drop the boundary lines and minister to those in need. It's not about who has what, but it is about being the Body of Christ and reaching those in need. He has a clear heart for non-Christians and desires to display the Gospel to them through the everyday act of eating a meal and communicating over rice or BBQ or whatever their culture might prefer. In all of this I cannot disagree. I just felt a bit badgered in the way that he presented his case. I rather walked away feeling like if I didn't practice hospitality his way then he would assume I was practicing incorrectly. I do believe that each one of us (Christians) are called to practice hospitality. (Take a peek only at 1 Peter 4:8-11 for proof.) I believe the Bible is very clear on that point. But as we have all been given different gifts and talents, as well homes and resources, I believe it will look different for each one of us. I know one particular issue that we have discussed over at Offering Hospitality is how to show hospitality to strangers (also a Biblical command) when you have a family and children to look after and care for as well. Chester tends to suggest that we should not think so much about exposing our children to different things (and even potentially unhealthy situations) and on that point I would heartily disagree with him. There are some strangers that I would absolutely think twice about before inviting them to fellowship with my family. There are some people who simply are not safe and I think we, as parents and thinking adults, must exercise some wisdom in how we may or may not expose our children to potentially harmful situations. I do not believe that I am called to open my home to anyone and everyone "off the street" per se. Again, I think some wisdom and discretion needs to be exercised because my ultimate priority is to raise my children right now. That does involve teaching them to practice hospitality - also to strangers - but even then I have to acknowledge that what works for me now might not work for my children and their families later. Definitely some thought has to be put into fellowship and it is important to see that our young children are protected and cared for. In today's day and age, I don't think that constitutes swinging wide the door and hollering, "COME ON IN!" to anyone and everyone. Caution must be exercised because, again, God gave us the blessing of children and gave us charge to protect and raise them. We must do that as well. So my stranger may look different than Chester's stranger. I don't think he distinguished between us very well - if he even meant to do so. In A Meal with Jesus , Chester does make some very good points about the value in sharing the Christian life over the table. He doesn't buy into your typical excuses as to why you cannot see fit to fellowship with others. (Too little time? Clear some. Small house? Invite a friend out for coffee.) I agree with him in all of this. We tend to make it harder than it has to be. Having someone over for dessert instead of dinner is acceptable for purposes of fellowship. One can eat just as happily off of a paper plate as off of a china dish. You can eat outside or inside, with children on the floor and adults taking up the table space! Have someone over to watch a favorite television show or movie. Anything goes, really. Just so long as you are doing it in the spirit which we are supposed to - to build community. As Chester points out, one day we will all be sharing one big feast and we act out that picture in our day-to-day meals here on earth -- right now. So while I would say (and Chester would say) that you do not need to surround yourself with excuses as to why you are strangely exempt from fulfilling the command of 1 Peter 4:8-11. Neither should you think no care or concern should be given to making your guest feel welcomed, loved and cared for. There are all sorts of things that you can consider when purposing to offer hospitality to another. Does your guest have food allergies? Do they have small children who might have difficulty getting the spaghetti from the plate to their mouth? Are their breakables in the house that should be put away before said small children come over? Do you have steps on your front porch that might make it difficult for an elderly person or someone currently using crutches to climb? Is there a single or a widow(er) in your church who is alone for the holiday season? All of these questions require thought and should not be avoided because they might also require work. Anything worth doing or having (friendships included) will require work. To assume otherwise is to lie to yourself. But you can choose the level of difficulty involved in your gathering. Perhaps it is best to invite certain couples over for dessert only, instead of a full meal. Maybe inviting another family to join yours at the park some Friday evening will do the trick. The point is to fellowship over the Gospel of Jesus Christ - to build the body of Christ and fellowship in spirit and in truth. As that is the ultimate point that Tim Chester is making in A Meal with Jesus , I think it is a worthy and thought-provoking read. Thank you, Crossway Books, for shooting a copy my way for my perusal. Stephanie and I would invite anyone who is interested in exploring various aspects of how to offer and practice hospitality to join us at Offering Hospitality. We love the interaction, suggestions and good discussions that people have gotten going which have all served to inspire us to be more creative and obedient to what we believe God's word calls us to - to build the Body of Christ through fellowship and communion with others. The quote about cooking is inspiring, as I admit it's not really one of my favorite things even though it's my main job. I remember when my then boyfriend, now hubby, first became Christians. His mom used to throw open her doors and in her tiny war time house which was all of about 700 square feet people would be packed in on a regular basis. An extra loaf of bread was thawed out of the freezer to help spread the meal and countless people were made to feel special and important. Many friendships were made and many people ministered to. She was a real example of hospitality. I think we tend to get too fancy sometimes and stress ourselves out over details when all people really want is company. Great thoughts! I'm reading this one right now, so I appreciate hearing your take on it. I enjoyed this book too--thought it was a good reminder that distance from people keeps us from deep fellowship. My first step is tiny. I've been meeting w/the same group of gals for several years now, and we've always met after dinner. We are now going to share a simple meal, over which we will chat and catch up, then after we eat we'll move into our discussion topic for the night. Tomorrow night will be our first meal! The challenge and passion Chester exudes was strong, but I appreciated his heart. Hmmmm, this sounds like a very interesting book! Thanks for the review! Sounds like an interesting book. It's that whole task vs. people oriented thing that trips me up. Ooh - this sounds like a book I'll enjoy. Hope I can get hold of a copy soon. I really appreciate your thoughts on this book. I have it on my Kindle...haven't read it yet...but it's in the queue! Though we are major introverts, we've been feeling that God is prompting us to exercise more intentional hospitality.